We are L Fulcher Funeral Directors in Stowmarket, and we are honoured to be able to help our local families celebrate the lives of their loved ones in a meaningful way. We will help to arrange a personal funeral service, befitting your loved one. We have experience providing all kinds of funerals, from religious and non-religious services to woodland burials and colourful celebrations. Whatever you feel is most fitting for your loved one, we will be able to help make it happen. You can reach us by telephone 24 hours a day. Our dedicated funeral professionals are always here to support and guide you whenever you need us. Call us today on 01449 613033 to talk through your personal requirements. 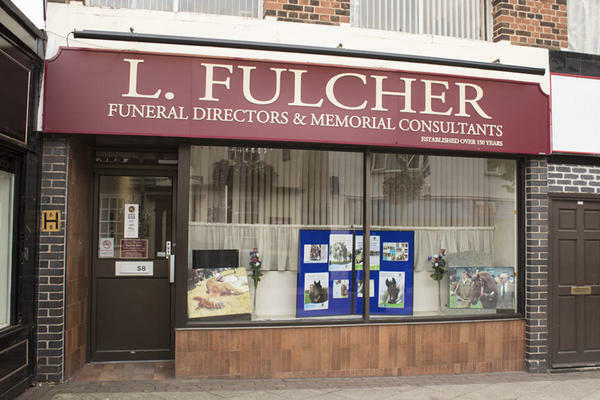 At L Fulcher Funeral Directors, we understand how special life is with those that you love. For us, every funeral is unique and personal. We have a service to fulfil every wish, with every detail carried out with the same uncompromising quality of care. From a traditional service, to a colourful woodland burial, your options are limitless with our Full Service Funeral. If you have a little more flexibility when it comes to arrangements, then we can provide a Simple Funeral for a lower cost. There is paid parking available on Ipswich Road. Our funeral home is located next to Vivien Joseph Jewellers on the main road of Stowmarket. Our staff are available 24 hours a day on 01449 613033 if you require our services outside of these hours. Thank you for posting your review online. I am pleased that you were so well looked after by our team and that the arrangements for your Father were carried out to your satisfaction.